There is a Melbourne zoo for everyone. Right near the city is the original Royal Melbourne Zoo. Second, there is the Healesville Sanctuary, a zoo for native Australian animals set in natural bush land. Last, there is the Werribee Open Range Zoo where you can go on Safari in its large Savannah grass lands. Into any of these zoos you can get much cheaper entry with the Melbourne Sightseeing and Attraction Pass. This is available for short stay tourists, and also for locals who can visit five Melbourne attractions at much reduced rates over a 3 month period. This central Zoo houses a range of animals from around the globe. 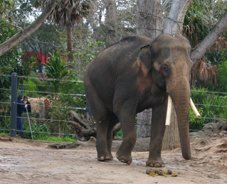 It is the zoo with a history and was established in Melbournes gold rush heydays. However, all that bears witness to the Victorian era today is a stately garden. Animal enclosures have changed and are in as natural environments as possible. It is quite amazing what they have achieved in a relatively small space. Narrow winding jungle paths leading through different bioclimatic zones, landscapes and animal enclosures that make the zoo seem much larger than it really is. The Royal Melbourne Zoo is located in Royal Park and accessible by tram and train. Less than an hour southwest of Melbourne is the Werribee Open Range Zoo, where you can go on a Safari and have an African wildlife experience. As part of a zoo visit you ride through African, American, Asian and Australian savannah  grasslands - in a safari bus encountering the grazing animals of these continents in large natural settings. African carnivores as well as hippos, and soon Gorillas, can be adored in their large enclosures from the zoos walkways. You also have the opportunity to walk right among the Australian animals. 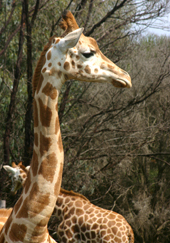 The Werribee Zoo can be reached by bus or car. It is very unique and our favourite zoo experience around Melbourne. 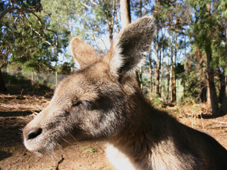 The Healesville Sanctuary is an hour drive northeast of Melbourne in the Yarra Valley. It is set in Australian bush and wetlands. As you wind your way around its pathways you get to see and have close encounters with many native animals. It is shadier there than Werribee and perhaps a better option on a hot summers day. It gives you a good sense of Australias wildlife and fauna, - from Kangaroos to Wallabies and Wombats, Koalas and Echidnas, Snakes and Emus. There are giant aviaries, birds of prey, all sorts of Australian reptiles, and a great Platypus display. You can get to the Healesville Sanctuary by train and bus or in your own car; or you can visit it as part of an organised tour from Melbourne, or as part of a Yarra Valley wine tour. Australia's only Southern Ocean Aquarium is a pretty special experience of the marine world. 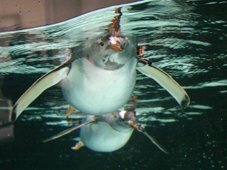 In the Melbourne Aquarium you will see arctic penguins in action and get among sharks, giant stingrays and sea turtles without getting wet  and even dive with the sharks. It is home to seahorses, sea dragons and over 10,000 other ocean creatures.